Milidzani is a legal practitioner, conveyancer and notary public with over eighteen years’ experience in various sectors of the legal profession including private practice, municipality and government. She joined Masiye-Moyo and Associates in Bulawayo as an Associate partner in May 2013. Her areas of speciality are conveyancing, drafting of agreements, notarial practice and legal process drafting. She worked for the Botswana Government as a Magistrate for 10 years between 2003 and 2013. During that period she was a member of the International Association of Women Judges. Prior to that she was employed by the Bulawayo Municipality as a legal officer for 2 ½ years. She practiced law as a private attorney in Bulawayo for 2 years between 1998 and 2000. 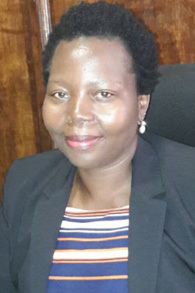 She is the current Vice Chairperson of the Zimbabwe Women Lawyers Association (ZWLA) Board having held the same position since August 2014. She is also a member of the Bulawayo Legal Practitioners Association.